How do you cook them in the crockpot?? I tried baking potatoes for the first time in my crock pot TODAY, thank you for opening my eyes! What temp did you have your roaster set at and for how long. Also did you wrap them in aluminum foil. Ummm….How do you turn off your rinse? My dishwasher has Jet Dry in it, which is automatically dispensed during each load. Guess that would just leave the spuds spot-free? The first time my mom walked in while I was using her sink as an extra large mixing bowl, she thought I was nuts. 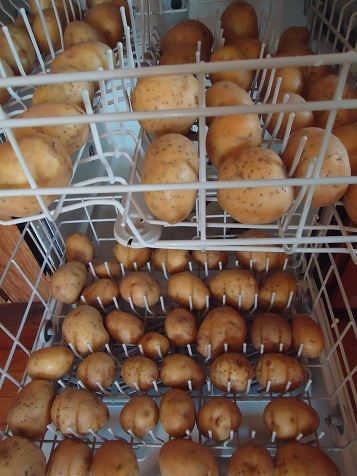 I can only imagine what she would think if she saw her dishwasher full of potatoes like this. I think I’ll make this my Thanksgiving visit mission…. to see the look on her face when she opens the dishwasher door, ha! We used to do this at a restaurant I worked at. Such a good idea! Baked potatoes are great when feeding a crowd. And everyone loves a baked potato bar!